It’s not too often that you get to use that phrase in a non-metaphorical sense, but if today’s meat CSA pickup was any indication, many sheep had been recently dispatched. This months share included pork spare ribs, a pork hock, ground beef, a whole chicken, two lamb leg steaks, and lamb chops. 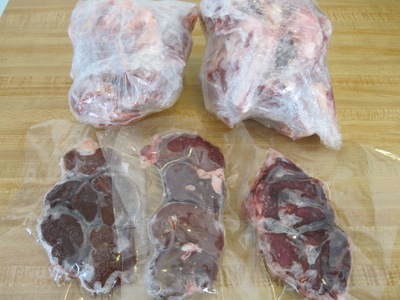 I added a dozen eggs, two strip steaks (soon to meet their sous vide destiny), a lamb shank, and some pork chops. The giveaway box, where I have previously scored fatback, leaf lard, and other lovely neglected animal bits, was full of lamb remains, some of which I brought home: lamb neck bones, kidneys, and hearts. I didn’t help myself to any lamb heads. Lacking a bandsaw, I have no way to split them for roasting. It’s Lambapalooza! The bones will be roasted and converted into stock, the hearts will be grilled, and the kidneys will be served with the lamb steaks. Time to consult the Book of Fergus for recipe ideas. Stay tuned. I look forward to the stories of success! I already have two quarts of gelatinous lamb stock.